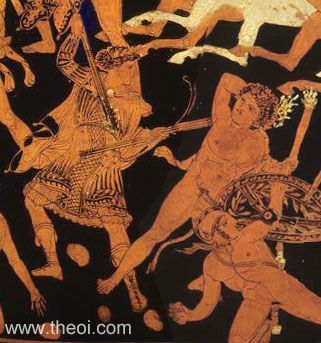 Detail of Hecate battling the Gigante Clytius from a painting of the Gigantomachia (War of the Giants). The goddess sets giant's hair aflame with a torch. She wears a knee-length skirt, Thracian vest and hunter's boots, and holds a pair of torches and a bow. The naked giant also brandishes a torch.